I have a question, since he is suggesting to use Synapse AF-4 Analog Filter which is a paid Utility/Effect extension ($45) is there another possible way to achieve what he was showing on the video with the free tools or the stock utilities that we have in RE10 ? It's a great tutorial btw, for those interested in enhancing the mastering process. You can do that with any eq or filter be it stock, re, free or paid. If you don't want to use the stock EQ for this, or Thor's high pass filter, or the mclass stereo imager, there is a free re in the shop, search for filter and you'll find it, magmasonic I think is the developer. I can give a try with the stock EQ in reason but I don't really know where to begin or how to proceed. Perhaps you could give me a tip or show me the proper way? An example with the M-class stereo perhaps ? I appreciate. I checked the free magmasonic on the shop and I noticed it has only a switch between 12 dB and 18 dB. I wish there was a switch for 24dB like in the Synapse. Use Thor then. You can use the high pass filter on it, it has a 24db option (as far as I remember). Search how to use Thor as a filter, once you got it set up, save it as a patch and just use it as a filter for your master bus compressor keying! Here is my Thor Filter Combinator. Ready to use, except that you should turn down the drive a bit maybe. Hope this helps. I tend to go with the simplest solution when it does the job as well as the complex solutions. What I’ve whittled my master section down to is simply a Stereo Imager as a HP filter. It’s amazing to me how much better the master compressor sounds when you balance the kick and snare by cutting lows to the side chain/key input. Keeps the kick from sucking out all the energy. I’ve been doing it this way for years, and hardly need to adjust the filter - it’s so simple and works so well, and I’ve not yet needed more extreme filtering solutions. Setup is simple and takes only a few seconds: set master inserts to be “PRE COMPRESSOR”, add a stereo imager to the master insert, then move the output from the “FROM DEVICES” jacks to the “SIDECHAIN INPUT” jacks and hit “SOLO HI BAND” on the Stereo Imager. Set the x-over to between 9:00 to 12:00 (depending on the mix) so that the kick and snare give you equal compression - or so the kick is compressing more equally with all the other tracks. This is the simplest and most direct way of getting side chain filtering to the master compressor. Using the same setup you can quickly substitute different EQ/Filters for more extreme applications. Plus, you don’t use a feedback loop like the tutorials that suggest using the Control Room output to feed the side chain input. You mean when I flip the rack by pressing TAB, then I should take the wires from Stereo Imager Audio Output (L+R) and assign them to The Sidechain jack on the master section rack? Something like in the screenshot below? I tried the method suggested by Selig but it didnt work. After assigning the audio output to sidechain of master section the sound is gone. What did I do wrong? You don’t even need the cables from the output of the Stereo Imager to the “from devices” jacks, it’s “normalled” without cables. As for what crossover frequency, it’s (as always) down to what you’re trying to accomplish. For me, I want to get around the same amount of gain reduction when the snare hits as when the kick hits. If it’s a four on the floor, then try to make it so the kick isn’t the only thing causing gain reduction! The frequency that ends up working will therefore depend on your source material (how bass heavy) and your intention. Last edited by Reasonable man on 08 Feb 2019, edited 1 time in total. Can i just ask that in order for the abouve configuration to work I presume that you would take the master outs and take them into a mix channel containing whatever inserts you want to use and then from that mixchannel finally into the audio i/o interface outs. Is this right? And if your putting your inserts (compression , saturation ,limiting etc) into a mix channel this way (intesad of using them in the master inserts slot) that you just have to make sure that the limiter is the last device in the mix channel chain? So i can keep doing it the way i was but not hitting the 'inserts pre compression' button or i could not use the control room outs and do it the way im guessing your doing it. The main advantage being that you can use the control room outs for other purposes. Yes, but they don't have to be in a channel as inserts, "free floating" or inside a combinator would suffice. Signal flow might look confusing after a while esp. with send efx connected. This is the reason why I personally don't like it the way selig does. You also lose the mastering insert "combinator" and its buttons and knobs in the mixer, unless you put everything in that master insert section which makes signal flow even harder to follow. Typically you'd want the master bus compressor to be your last limb in the mixing chain, but in any case before you do anything mastering related. My point was to distill the concept down to the basics, and avoid using the master out or control room out, period. You only need two connections to make this work, no matter which EQ or filter you choose. Using splitters or a mix channel isn’t necessary at all, even for more complex setups. I keep things as simple as possible mainly to speed up my workflow and eliminate possible confusion at a later date! My approach begins with the idea that you want ito use a “clean” signal for the side-chain. But if you use the CR, the signal you’re using is not only already compressed by the Master Compressor, but also affected by all the other stuff I see in your master insert. To my way of thinking, you’re taking the signal for the side chain from the wrong end of the signal chain! Take it instead from the start, not the end. To do this, make sure inserts are PRE COMPRESSOR. This means the “To Devices” jack gives you the raw master bus signal, before hitting anything else. Take this signal (as I already explained above) into the Stereo Imager (or other filter/EQ), and then into the side chain input. But if you want more stuff on your master (as in your attached pic), and you want it BEFORE the master compressor, then you can use the main output on the Stereo Image to feed the other devices and use the Separate Output/High Band for the side chain input. No splitter needed. 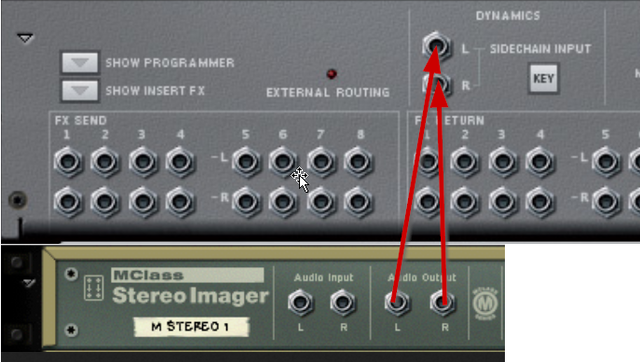 And if you want to add more processing AFTER the compressor (sometimes preferred so that changes to the other devices don’t require changes to the compressor), you’ll need to patch it between the Master Outputs and the Hardware Interface (which is how I do it - see below). That being said, I use a different approach for further “mastering” devices, which I patch AFTER the Maseter Outputs of the mixer (as it would be done IRL). There are two reasons for this. One is because of dither, which needs to be last and you cannot change levels after adding dither - so you cannot put anything that adds dither in the Master Insert if you’re going to do a fade out with the Master Fader. Another is that I like to keep mixing and mastering devices separate - I consider the Master Compressor to be a mix device, being a long time SSL mixer guy. Makes perfectly sense to start with the Stereo Image before everything else. I will try that in my next music project. Is there a picture I should see or it was related to your last comment? I don't see anything Im sorry . What is dither in the mastering exactly if I am asking? I am sorry, I am not experienced but I would appreciate to know all the techniques for mastering, at least to do it in the proper way. The only place I saw the word dither was when saving my project to a WAV file at 44.1 Khz and 16 bits. That being said, I use a different approach for further “mastering” devices, which I patch AFTER the Maseter Outputs of the mixer (as it would be done IRL). For the record, the fact that you can't put "mastering" devices visually ABOVE the master (sic!) section- and before the audio output (the IRL way), and the way those multimasteringeffectscombinators are presented by Reason (as inserts) is very confusing, even more so for unexperienced users. I wished they changed that and added at least some kind of collapsible box up there, one like the master insert section is.